State-of-the-art headphone amp. High-End preamp. Four inputs, two outputs. Twin 6SN7EH, 1 x 12AX7EH Electro-Harmonix current-production valves. 12AT/12AU drivers interchangeable to adapt the overall gain structure to the end user's system and 'phones. Outboard DC power supply with 5.5" umbilical and twist-lock socket. High-current switch-mode filament voltage supply. DACT stepped attenuator. Hovland MusiCaps. Halco film resistors. Relay turn-on with auto mute during circuit stabilization. Quasi half-width enclosures. Fine fit'n'finish. Superb build quality. The best its maker knows how to design. A full-collision dead end for the usual upgrade path of parts substitution menus. An end to anxiety over MkII and III iterations. A circuit deliberately optimized for the ultra-affordable tubes supplied. Expensive NOS tube rolling for "better sound" presumably less than attractive and possibly quite unnecessary altogether. 7-day in-home trial privilege. Who you gonna call? If Ray Samuels had any say in this, his Emmeline II Stealth ghost buster of course. Dimensions with tubes installed and the chassis stacked are 10.25" W x 8" H x 7" D. On their own, the power supply measures 3.5" tall while the control unit is 2/4" without/with tubes sticking out of its top. The clean high-quality exteriors are mirrored on the insides to demonstrate Ray Samuels' 'military spec' execution and attention to detail which appears to be every bit the equal of the famous big dogs. 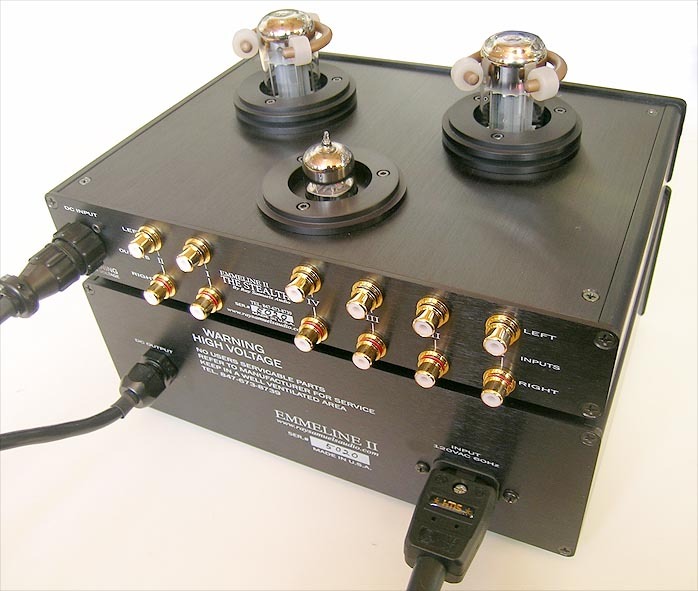 I wasn't able to obtain exact specifications such as claimed bandwidth, S/N ratio, channel separation, inter-channel volume tracking or precise gain for the 12AU/12AT/12AX dual-triode driver tubes but would expect that they'll be added soon to the Ray Samuels Audio website. The separate DC power supply can be placed directly underneath the control unit, beside it or on a different shelf in an equipment rack altogether, with the umbilical long enough to accomodate that kind of physical separation. Because of its stealthy HighEnd ambitions, testing would occur exclusively in the big rig, with preamp prowess adjudged against the Wyetech Labs Pearl tube and the Bel Canto Design PRe2 transistor units, and headphone drive into my audio-technica ATH-W1000s and Sennheiser's HD-650s. Front end duties in all cases would be handled by the Accustic Arts Drive-1 tethered to my Zanden Audio Model 5000 Mk.III or the Audio Aero Prima DAC via Stealth Audio's excellent Varidig cable. 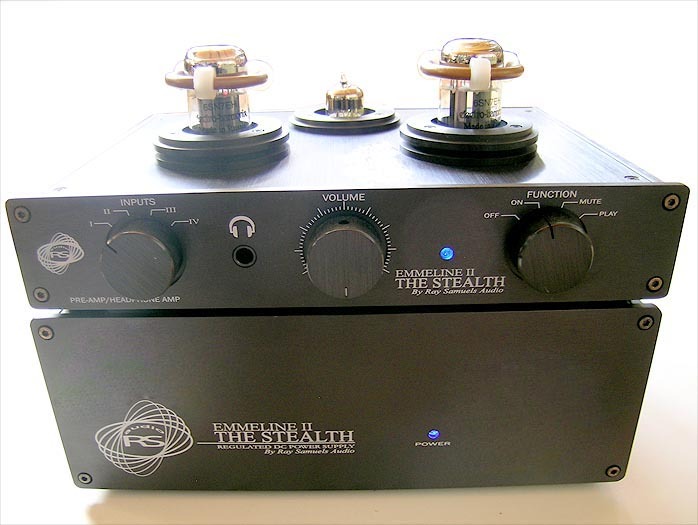 Preamp users alert: Inserting a headphone into the Stealth does not mute the pre-outs.